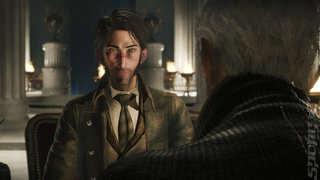 I really enjoyed the first episode of The Council, entitled The Mad Ones released earlier in the year. It wasn't without its problems, but its innovative new take on TellTale-style adventure games focused on RPG-style character upgrades caught my attention. The first episode set the scene by establishing the characters and providing a real incentive to play the second episode, largely because of the well-designed cliff-hanger that closed the episode. The story is intriguing - the player's character, Louis de Richet, is invited to join a gathering on an island of some of the world's most powerful and influential figures in the 1790s. His mother, Sarah de Richet, has gone on ahead and seemingly has clandestine business with each of the dignitaries on the island. Strangely she appears to have gone missing, although it is not clear whether this was by design or whether foul play was involved. Ostensibly, Louis' mission is to find his mother and discover what she has got herself involved in. However, during the first episode, it quickly becomes clear through conversation with individuals such as Napoleon Bonaparte, George Washington and the mysterious English Duchess, Emily Hillsborough, that everyone has an agenda. 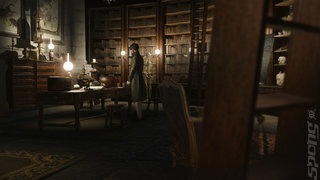 As Louis de Richet, the player is able to approach the various puzzles and dialogue choices in a number of ways. Louis' abilities can be upgraded over time with experience points, so the player can decide what kind of a person they want to control. I preferred to focus on diplomacy, making sure that my character was experienced in linguistics, etiquette and foreign affairs. This gave me the edge in conversations with politicians, such as George Washington and Napoleon. However, because I had chosen to ignore upgrading my skills in the sciences puzzles were more difficult to solve. This didn't cause me any problems in the first episode, which was very dialogue heavy. It quickly became apparent to me that there were always multiple paths towards the end of point of the chapter. I found this to be a very satisfying mechanic as I have never been fond of esoteric puzzles in narrative-based games and given the choice I would much rather talk my way out of a problem than solve a mystery. I was hoping that this style of gameplay would continue into Episode 2, Hide and Seek. Unfortunately, however, the episode has a significantly different structure to the more open style of the first episode. This is perhaps inevitable given the narrative path the developers have chosen to undertake, but it did make my focus on diplomacy feel a little redundant. Hide and Seek focuses to a far greater extent on puzzles and deductive reasoning than the first episode. Although there are numerous conversations to be had, none of these feel quite as open-ended as in the first episode. I felt significantly more pressured to follow a specific path and rather regretted having such an unbalanced character as it made puzzle-solving more complicated. If I had put more experience points into 'logic' and 'science' then most of the puzzles could have been bypassed. This is a curious system as I would have thought that if my character had wanted to engage more in problem-solving then the upgrade abilities would have made each puzzle more complex and interesting, rather than a tool to avoid them entirely. This was a lesson learned and by the end of the episode I had attempted to ensure that my character was a little more balanced in order that more options be open to him as the game progressed. It was still possible to progress, even with underdeveloped skills, but I found it significantly more time consuming to do so. Despite the increased focus on puzzles and cryptic knowledge, the narrative continues to be well developed and intriguing. I do not wish to spoil details of the story here, but suffice to say I came away at the end of the second episode with significantly more questions than I had at the start of the first episode. Fortunately, it does feel as if the story arc for the five episodes will provide a satisfying conclusion as episode two builds on and extends the plot threads of the first episode. This provides conclusions for some points and further exposition for others. 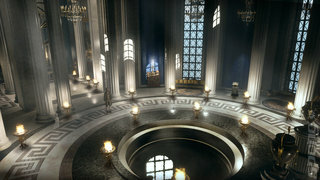 The mansion within which the game largely takes place is still a fantastically atmospheric place to explore. The creaking floorboards, the detailed real-world paintings and collectible books creating a real sense of place within the historical context in which the game is set. However, unfortunately the technical problems that slightly spoiled the first episode are also present here. The first section of Chapter 2 is particularly problematic. On the first-generation Xbox One I am using to play the game, there was significant slowdown, dropped frames and stuttering. This was particularly unfortunate during dialogue scenes as it rather spoiled the quality of the delivery. Fortunately, towards the midpoint of the episode these problems became less apparent, although I suspect that this is largely because fewer character interactions happen at this point. 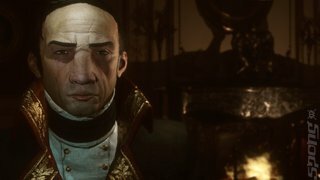 The Council continues to be an intriguing and well-designed adventure game, only slightly let down by continuing technical issues. This episode may not have allowed me to focus on the area of the game I find most interesting, the dialogue between characters, but narrative developments and reasonably well-designed puzzles helped to ameliorate this problem and I felt thoroughly satisfied with the direction of the story by the end of the episode. I am greatly looking forward to seeing where developer Big Bad Wolf take the story next, as the predicament that I felt Louis was in at the end of the episode could have a number of serious ramifications. I just hope that perhaps in the interim before Episode 3 is released some more work can be done on improving the technical side of the game. Although these problems are far from fatal, they do rather undermine what is fast becoming one of my favourite narrative adventures of recent years. + Dialogue options continue to entertain. - Shift in gameplay focus provides fewer options. - A little short compared with the first episode.